Astrogeographic position of London for morphogenetic field level 1 which shows the supraregional and international qualities and resonance degrees of the british capital and government: according to my calculations London the capital of the UK and historical center of the Commonwealth is located at 24° of aristocratic, courtly air sign Libra and 27° of conservative, hierarchical, strict earth sign Capricorn. Other important coordinates are: Edinburgh: 22°Sagittarius – 8°Cancer, Cardiff: 22°Sagittarius – 25°Libra, Belfast: 19°Scorpio – 10°Leo, Dublin: 15°Scorpio – 10°Virgo. The Brexit referendum was held just at the beginning of Uranus` transit over 22°-30° AR and in a square & opposition to the 24°LI and 27°CAP astrogeographical resonance degrees of London between May 2016 and March 2019. Uranus as the planet of globalisation explains that the decision taken in the referendum was heavily influenced through global media players. The UK had cultivated a big problem with the dominance of foreign media in the country since WW2. Such globalized propaganda is not new in world history of course. But the huge influence of the social media was a completely new factor to global politics as it had just started to unfold since around 2008. During the process of a Uranus opposition and susequent square transit seems the autonomy of nations and their governments can be challenged heavily. 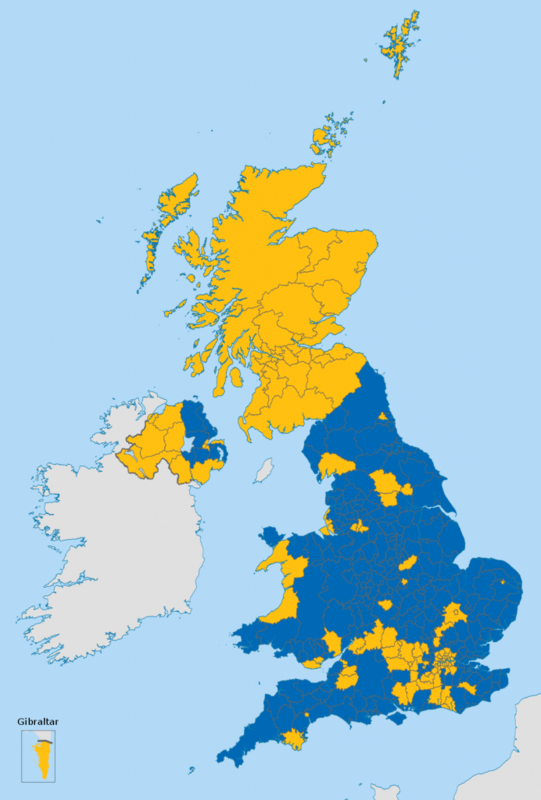 The results from the United Kingdom EU-Membership Referendum on 23 June 2016 seem to have brought to the surface the apparent need to go through a process of deep transformation of the countrys and nations self image. In fact the historical role of the United Kingdom is outstanding. In the history of modernity the UK can easily be named the most influential of all nations. It is the motherland of the world`s leading language and culture, of globalization itself and of the victory of globalized capitalism over national cultural inheritance in literally every single country and nation on our planet. 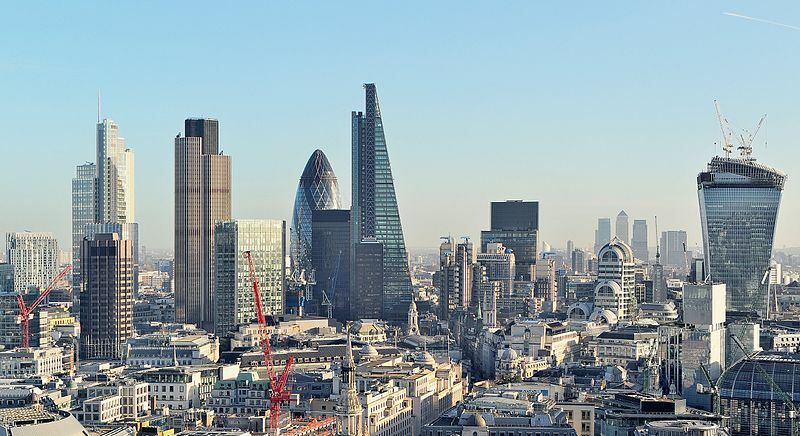 Since the UK joined in the race of european colonialism during the 16th century an won that race in the late 18th century the UK had taken the role of a Roman Empire of the 2nd millenium with London as the first global capital. Still today – in the 3rd millienium the British Queen functions as the head of state of the former supercolonies Australia and Canada. This historical background could simply make it implausible to some people that the UK should cooperate with the European countries or other partners as equals not to mention join a future European Federation. The success of the “Make Britain Great Again” campaign in the Brexit referendum shows how diffcult it is for a nation to get over a habitual profile neurosis from its successful, glorious past and develop an authentic relationship to its real and fuller potentials in the presence when they are reduced to the pseudoimages from greatness, victory and dominance from times long passed. The Uranus transit challenged the fundaments of the self images and even territorial integrity of the United Kingdom along with its political system. And It will be followed by a consolidating transit of Saturn in 2020 and later of highly defensive Pluto conjunct London between January 2021 and November 2024. It is a special quality of the City of London that its two astrogeographical resonance degrees are in a square to each other. Of course such squares reflect tension and confrontation. But at the same time they can also serve to include competing point of views in one and the same place. In capitals but also companies that can make such astrogeographical squares highly productive for managing the confrontation of different regions, interest groups or parts of society and particularly helpful in handling supraregional topics. In regard to planetary transits one aspect of such squares is the simultaneous or subsequent transit of a planet in conjunction or opposition with one coordinate and in a square with the other at nearly the same time. The year of 2020 will see such a transit of Saturn first in an exact square to the 24°Libra coordinate and later over the 27°Capricorn coordinate of the British capital from the middle of January straight until December, 20 when Saturn`s ingress into Aquarius will finish with the period. 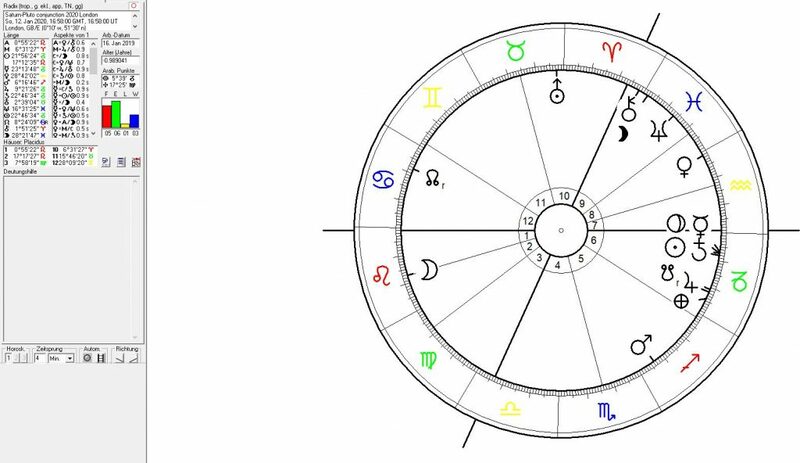 Saturn´s transits in conjunction with capitals are often highly stabilizing for the political institutions, governments and the autonomy of countries. And even more so when Saturn will be moving in his own sign Capricorn.